Yesterday I received an email forwarded from an acquaintance regarding an AOL story which references an AutoTrader.com survey. The survey was about at what price per gallon car buyers will significantly consider a vehicle that offers better fuel economy. The AOL headline read “Car Buyers Won’t Change Habits Until Gas Hits $6.51 A Gallon“. After reading the article I immediately went looking for other views… One blog I found commented how the sensational headline didn’t match the facts of the article, presenting a slated view of the data from survey if one were to stop at the headline. According to the AutoTrader survey data, fuel would have to be over $6.51 per gallon before 35% of respondents would “seriously consider a vehicle that got better fuel economy”. Another way to look at the article is that nearly two-thirds would seriously consider a vehicle offering better mpg before fuel reached $6.51 per gallon. The AOL article also quotes different experts about citizens already making decisions influenced by the current higher prices, or just getting accustomed to our higher fuel prices. 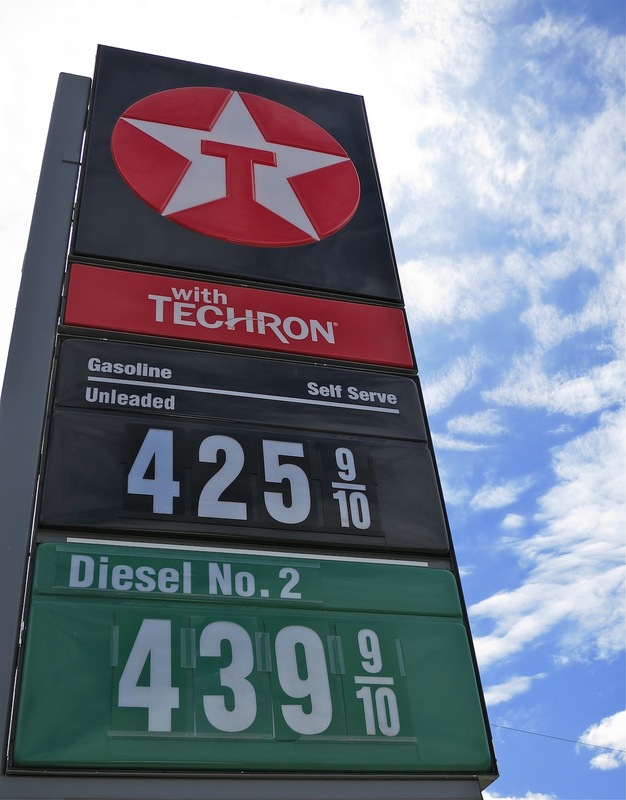 High Gas Prices, April 2012. With our little fleet of vehicles fuel economy has always been important and is tracked with every fill-up, even the motorcycles. This doesn’t mean that we are rabid hyper-milers, but we have always had a healthy awareness of how much fuel we burn and what it costs. Long before fuel reached it’s current high price near $4, fuel economy was a factor when we considered adding or subtracting horsepower in our stable. We like and use trucks and four-wheel-drives, not just because they are cool or became trendy, but to haul and pull things, and to go beyond the blacktop. I will likely remain a truck guy instead of a car guy until I can no longer afford to operate and enjoy them, or change hobbies and lifestyle. When my wife and I purchased a new pickup last year, fuel economy was certainly a consideration, but not the only deciding factor. While we would have preferred the slightly better mpg possible with a Toyota Tacoma or similar smaller truck over the Tundra that was chosen, the potential fuel economy improvement was not worth the inability to haul and pull larger things, and do big truck work. Added to this preference for full-sized capability is the fact that we already have a mid-sized utility vehicle, another mid-size would be redundant. Mixed with our 4WDs are two very economical daily-drivers, one two-wheeled, one four, and the four-wheeler gets about the same (sometimes better) mpg as the moto. As shared recently in the TDI Mileage Test post, our little VW Golf diesel is a very valuable daily driver. In recent years we’ve been casually watching the automotive market to see what we might want to purchase when it’s time to replace the TDI. We have considered some AWD cars, but their fuel economy is typically so much lower than the VW/Audi TDI that they’re not serious contenders for our dollars. We like being road travelers, even in a car, which means keeping at least one very high mpg four-wheeled vehicle in our fleet for daily driving, weekend errands, and car trips is a nonnegotiable. Fuel prices are already high in my opinion. With a fixed amount of dollars budgeted for fuel each month, higher fuel prices mean driving less, getting better mpg, both, or deficient spending—which is not allowed here. What is your number? Are you part of the top third who won’t seriously consider a more economical vehicle until fuel is $6.51 a gallon?